Coroner Ridley acknowledges there is no substantiation for Hunt’s allegations in a court of law. Not now, not yet. There has been no physical evidence of Sergei Skripal since the afternoon of March 4, 2018, when he and his daughter Yulia Skripal, fell ill on a park bench in the centre of Salisbury, and were hospitalised with what the local police and medical personnel first suspected to be food, alcohol or drug poisoning. The British authorities then announced that the Skripals were suffering from nerve agent poisoning. The Skripals recovered and were released from hospital, Yulia on April 10; Sergei on May 18, according to the official announcement. There is independent evidence confirming this for Yulia Skripal, but not for her father. Read the full archive of this case here. This month, evidence released by the Wiltshire county council confirms that the interior of Skripal’s house on Christie Miller Road, northwest of the Salisbury city centre, was so badly contaminated by a nerve agent, the roof is now being demolished and replaced. The council has also revealed that “much of the interior [has been] gutted and rebuilt.” The British authorities have failed to explain how the allegation of a Russian nerve agent attack on the outside door handle could have resulted in the contamination of the interior of the Skripal house; read more of the evidence. On September 5 Prime Minister May told the House of Commons that indictments of attempted homicide and chemical warfare offences against GRU agents were being drafted. Four months later, the prime minister’s allegations have not been presented to a British court. Only two court hearings have been held on the Skripal case so far. The first took place in the High Court in London on March 20-22, 2018, when the Home Office applied for permission to obtain blood samples from the Skripals who were reported to be unconscious in Salisbury Hospital. The judge’s ruling approved the sampling procedures. Initial samples, he said, “tested positive for the presence of a Novichok class nerve agent or [sic] closely related agent,” the ruling said, without further precision or identification of the source of the “agent”. Subsequent Swiss laboratory testing of these blood samples reportedly identified traces of the US and NATO-inventory nerve agent, BZ. The second court hearing occurred in the Wiltshire and Swindon Coroner’s Court on July 19. Rowley, the only surviving witness of what happened to Sturgess, did not testify, nor treating doctors and pathologists from Salisbury Hospital. For an outline of what British coronial law requires in these cases, click to read. The cause of Sturgess’s death has been announced by Prime Minister May, Foreign Secretary Hunt, spokesmen for the Metropolitan Police, and the British media as the same Novichok which was allegedly sprayed on the Skripal front-door handle. Although the two incidents occurred almost twelve weeks apart in time and nine miles in geography, the British Government claims that Russian GRU agents were culpable in both. Coroner Ridley’s inquest is legally required to test this claim by identifying precisely what caused Sturgess’s death; what was in the bottle recovered from the Amesbury home; where the bottle had come from, before it reached Sturgess and Ridley in Amesbury. A post-mortem on Sturgess was carried out on July 18, the day before the inquest opened — ten days after her death. Ridley refused to explain this delay. This is significant because toxicology testing commenced immediately after Sturgess and Rowley were admitted to hospital. These tests continued to determine whether opiates, such as methadone and heroin, were present; Rowley has publicly admitted to being treated for heroin addiction with methadone; it was initially suspected by the hospital that he and Sturgess were suffering from an adverse drug combination or opiate overdose. Because nerve agent traces dilute and disappear rapidly, blood sampling and testing of Rowley and Sturgess would have started after June 30, upon their hospitalization, and before July 8, when Sturgess died. Ridley was asked what additional tests have been carried out and reported to him since he adjourned the inquest proceeding on July 19. He refuses to say. He does acknowledge that the decision on which experts to call for which tests is “a judicial decision made by the Coroner”; in short, it’s Ridley’s decision to make. Ridley has been under orders from London to delay the inquest. In other words, British government prosecutors have told Ridley not to proceed because a “person may be charged” with homicide or a “related offence”. This means that no one has been charged yet with an offence related to Sturgess’s death. Noone means no Russian GRU agents. While the coroner has kept silent, Rowley, the media, the police, and the government have all reached conclusions which the coroner is refusing to make officially. Rowley claims he found the lethal box and bottle and brought them to his home before opening the box and exposing Sturgess and himself to the bottle’s contents. However, he has given incomplete and ambiguous accounts of where he first found the box. On July 26, Rowley claimed he and Sturgess had been with friends in Salisbury city centre on June 27, and that he had found the box and bottle then. In a tour of Salisbury with an ITV reporter team Rowley claimed he could rule out several places where he might have found them, but he wasn’t certain he had retrieved them from charity bins behind shops on Catherine Street. has not yet been accepted by Coroner Ridley. “It’s very frustrating… I’d like to be able to say exactly where I got it from but I can’t…. I’d love to be able to help as much as I can but it’s not helping if I make it up,’ he said. We took Charlie to other key locations in the city and he was able to rule them out”. By this week, when Ridley was asked questions about the testing he had ordered on July 19, he will have received a report from the police and the Porton Down laboratory to say whether there is any corroboration of nerve agent traces from box or bottle in the Catherine Street bins. The coroner has a problem: if the bins have tested negative at Porton Down, there is no chain of evidence admissible in the coroner’s court to link the bins in Salisbury to the death of Sturgess in Amesbury. Neil Basu, speaking in London on September 5. 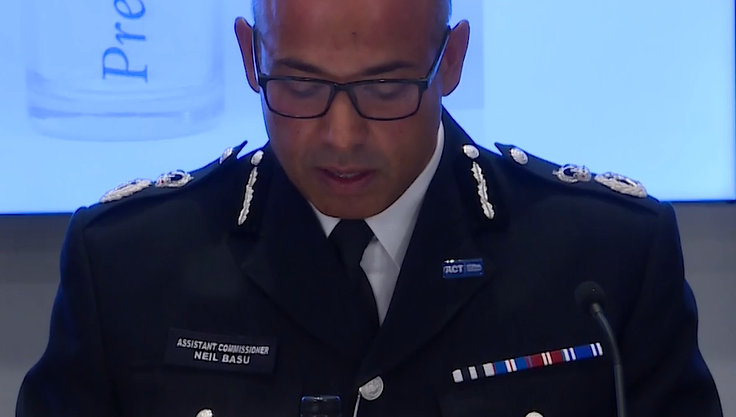 Basu headed Scotland Yard’s operations against organized crime until March 5, when he was promoted to become head of counter-terrorism operations; Basu’s promotion came the day after the alleged attack on the Skripal door handle. 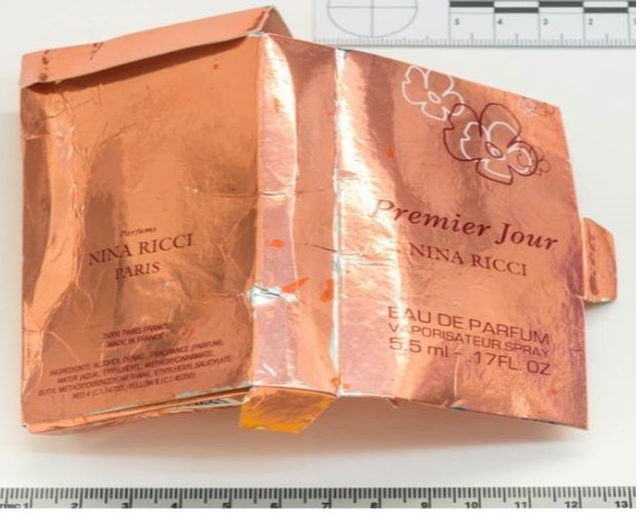 Source: https://www.thesun.co.uk/ On September 5, Assistant Commissioner Neil Basu gave a 3 minute-11 second briefing with illustrations of the box and bottle. Listen carefully as Basu reads from his prepared script. 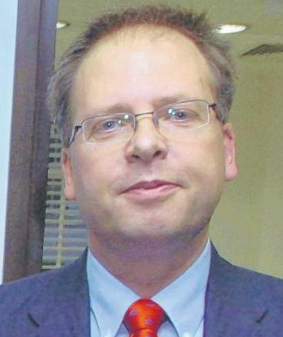 Basu was certain on the point Rowley could not confirm; the only evidence Basu mentioned was Rowley’s. The box and bottle had been found by Rowley in a charity bin on Catherine Street on June 27, Basu’s script insisted. But Basu also issued a qualifier. The police “cannot account for the whereabouts of the bottle, the nozzle or the box between the attack on the Skripals on the 4th of March and when Charlie Rowley said [sic] he found it on Wednesday, the 27th of June. It’s crucial we find out where that box was. Did you see this pink box or the glass bottle during that time?” (Min. 02:18-36). Basu appealed for witnesses and “any information on where it may have been”. Basu’s wording wasn’t accurate. According to Rowley, the box he brought home to Amesbury on June 27, then opened on June 30, was sealed in cellophane; to open the box for the bottle inside, Rowley has claimed he had to tear open the wrapper. This suggests noone had opened box or bottle at the time of the alleged Skripal attack. Its whereabouts on or before March 4 are as unsubstantiated as Basu has admitted for the weeks following. Basu’s briefing is evidence of the opposite of the newspaper headline. When Basu was reading out his report, the police had no corroborating evidence of what Rowley had said about the bin; this means no corroboration from Porton Down of nerve agent traces in the bin. It also means the police have searched the CCTV records of the location on Catherine Street and have found no evidence that Rowley had been there on June 27. The detailed recovery of CCTV evidence of the two Russians moving around Salisbury on March 4 indicates how much the police and prosecutors know about their movements on the day of their alleged attack. But if there is no CCTV evidence of the Russians on Catherine Street on March 4, and no CCTV evidence of Rowley at the same place on June 27, then there is no telling how the police came to find box and bottle in Rowley’s kitchen when Basu says they did. Basu’s appeal for witnesses is indirect proof of what the police did not, and cannot, have reported to Coroner Ridley, at least in September. Listen to Basu explaining how the box and bottle were found by police. At Min.1:09 he said a “small box labelled as Nina Ricci Premier Jour” had been found by police in a kitchen rubbish bag on July 10. At Min. 1:24 Basu said the police had found “a small glass bottle with a modified nozzle…on a kitchen worktop.” That discovery, Basu said, was on July 11. These dates indicate exceptional slowness on the part of the police to search Rowley’s home once nerve-agent poisoning had allegedly been diagnosed at the hospital. Also, twenty-four hours appear to have elapsed in the official evidence log for the police to find the objects, box and bottle, although they were no more than a metre from each other in Rowley’s small kitchen. At Min.2:08 of his briefing Basu claimed that testing of the bottle revealed “a significant amount of Novichok”. Nothing Basu or media reports of what the police have been saying is evidence admissible in Coroner Ridley’s court for when and how the box, bottle and Novichok arrived at Rowley’s kitchen before Sturgess collapsed. 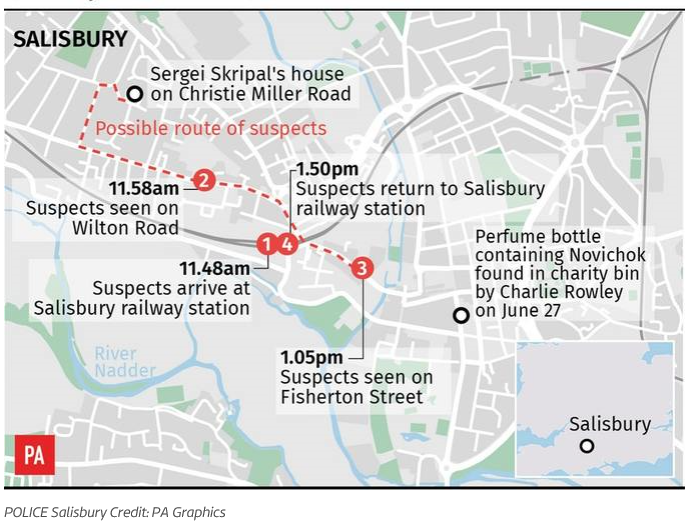 The mystery of the box and bottle whereabouts is compounded by the geography of Salisbury and by the allegations which the police and press have broadcast about the alleged Russian attack on the Skripals. This map, published on September 5 by ITV, was based on police releases of CCTV images and is an officially authorized reconstruction of events in the Salisbury city centre. It indicates that the Russian “suspects” arrived at the railway station from London at 11:48 on March 4; took between 10 and 30 minutes to walk from the railway station northwest towards Christie Miller Road before reversing their direction southeastwards, walking for another 60 minutes or so, and returning to the railway station at 13:50. The police allege the Russian attack on the Skripal house occurred between 12:10 and 12:40. Local residents report that the walking time from the railway station to Christie Miller Road is about 20 minutes, and the time required to walk from Christie Miller Road to Catherine Street, about 30 minutes. The Russians were also recorded on CCTV as being on Fisherton Street, just north of Queen Elizabeth Gardens at 13:05. Other reports indicate that on March 4, before their collapse, the Skripals fed ducks in the Gardens. On June 27 Rowley has testified that he, Sturgess and friends also spent time in the Gardens. The ITV map confirms that the police have released no CCTV imagery of either the Russians or Rowley on Catherine Street, which is about 10 minutes’ walk from the Gardens. For an independent analysis of the CCTV images of the Russians and their movements in real time on March 3, the day before the alleged attack, read this. For analysis of their movements on March 4, click to read Rob Slane’s report of October 3, and his report of October 7. Slane’s reporting casts doubt on the accuracy of the times of movement captured by CCTV images released by the police. Simply, the Skripal house, where the alleged Russian agents are accused of having sprayed the outside door lever between 12:10 and 12:40 on March 4, is to the northwest of the Salisbury railway station, where the agents went after their assassination attempt. 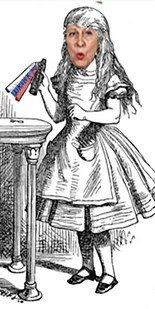 If, as the British police claimed on September 5, the assassins did not bolt directly for the train to London, and thence to Heathrow airport for an Aeroflot flight back to Moscow, they would have made a lengthy detour to the east of the city centre to Catherine Street, in order to get rid of an incriminating box containing a bottle of Novichok. This detour, if it happened at the speed the CCTV images already show of the Russians walking around Salisbury, would have taken them at least an hour. While this is unlikely practice for professional assassins, if they had done so in order to dispose of their weapons, the police would already have CCTV images of this detour; just as the police have reported, and published, images of the Russians “in the vicinity” of the Skripal house earlier that day. The later images, if they exist, will either be confirmed by Coroner Ridley, or he will have to rule that no connexion is proved between the March 4 and June 27 incidents; at least not the connexion on which the British Prime Minister and her Government insist. For additional details of the box and bottle – including the implied evidence of two bottles – read this.